In Japan, household items and tools that have passed the 100-year mark receive a soul. They are called Tsukumogami and the holiday dedicated to them is the Sweeping Soot, during the festivities old tools are thrown out into the alleys all over Japan. There is a tale from the Kenpo period in which the Tsukumogami are having an avid discussion about having served their human owners and masters for such a long time without finding much recognition at all or receiving even the slightest hint of gratitude. They are complaining about such treatment and eventually decide to take revenge. The old tools, amongst them a bat and beadroll as the main aggressors gang up on their old owner Ichiren-Bonze and almost beat him to death. The moral of the story is that all creation is equal and that all things created by God and also by man are Yin and Yang. The tools decide to wait for the Bean-Throwing Festival when Yin and Yang are counterchanged and ask that they – as soulless things – be given a soul and a life free from servitude. 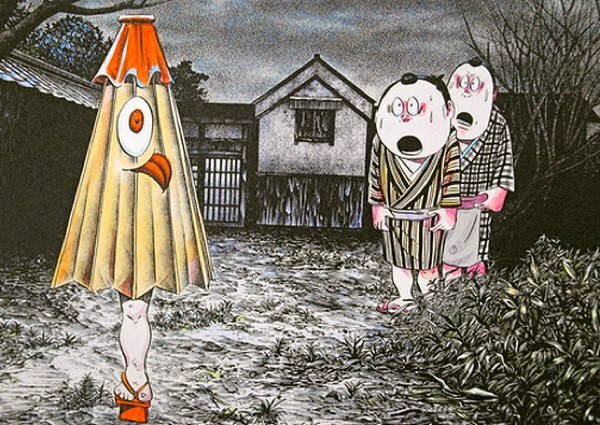 On the night of the Bean-Throwing Festival all tools anxiously gather together and in a flash of light, are being granted their wish, transforming into men, children, other changing into beasts, monsters or curious looking tools with somewhat of a face and extremities. Out of gratitude, they decide to build a shrine to the God of Creation and worship him as the “Deity of Transformation”. Meanwhile, Ichiren-Bonze, deeply moved by his near-death experience, becomes an ascet and dedicates his life to spirituality and learning to treat all living and inanimate things with respect. After much strife and battle with the humans who looked with contempt and terror upon the Tsukumogami, they decide to find Ichiren-Bonze to have him teach them about Buddhism (Singon sect)and spirituality. With his help they attained Buddhahood at last.